Wishing you all the most amazing day and this really does go out to all dad's, those that have taken on the role as daddy, those who have passed to heaven, those who are alive and every other person out there who are raising kiddies. Today my little brood are celebrating hubster and all the fantastic things he does every.single. day. Typically we celebrate low-key - a card, a small random gift, a good home cooked meal and family time. For us that's far more important than anything extravagant however, over the last twelve months we have been through hell as a family unit and you know, hubster has been our rock throughout, he'd tell you ''it's his job'' but you know, not many people would stay so calm and rock steady throughout. He's seriously amazing, incredible, supportive, selfless and he really amazes me every single day so this year we decided to celebrate him that little bit more. Yesterday we headed out to Livingstone to check out the shops - this year we were going a bit more upscale with our gifting purely because there was a few things we knew that hubster had coveted for a while and he wouldn't buy himself (again due to being selfless, he'd much rather purchase something for the boys or me). The first was a Superdry hoody. Personally I don't see the appeal with Superdry - it's overpriced and very bland but hubster had spotted one he really wanted and hadn't purchased it. He'd been coveting one for around six months, so you know, it was clear it was something he really wanted. The second item we knew he wanted or at least loved was the Deadpool movie. the boys also wanted to pick up a Flash, Funko Pop Vinyl - hub is a huge Marvel and more so, Flash fan. In the end, we did pick up the grey Superdry hooded top which was around £50 (crazy right?? 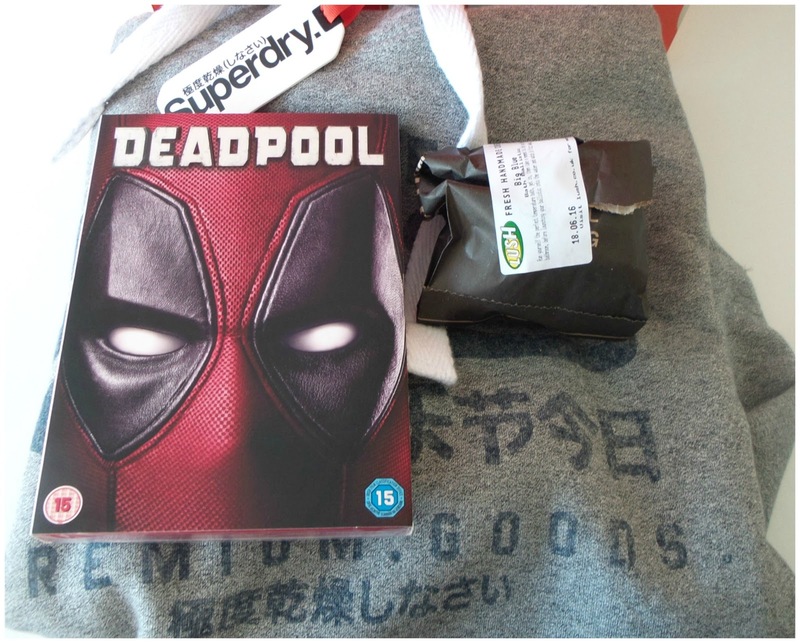 ), the Deadpool DVD for £9.99 - but - instead of the Pop! which we couldn't find in the Flash design, we opted for the Lush Father's Day charity gift. Basically the boys got the opportunity to be hands on with the creation of a bath bomb. They wrote a message to daddy which was rolled up and popped into the middle of their bomb. Along with the bomb came the small tub of Charity Hand & Body Cream all for £3.50. Bargain! The proceeds of course going to charity which made it even more special. Hubster doesn't use bath bombs but honestly I know he's going to love this gift more than any of the others as the boys actually made this themselves. While our gifts were splurges we are well aware that this isn't something we'll be capable of every year. Not with birthdays, the car MOT coming up and then of course Christmas. I tend to get really stressed out when it comes to forward planning but a few friends did advise that Ocean loans are a great reliable provider for handling this sort of situation if it comes to it and we're strapped. I'll close just now as we're away out for the day, hubster's just about to open his gift and, no doubt we'll be enjoying the hilarity that is Ryan Reynolds as Deadpool later on this evening. Wishing you all the most amazing day guys! I'll let you know what hubster thought tomorrow.